Where’s The World’s Coolest Airport? If you're gonna be caught in one for several hours, it might as well be interesting. Coolest is used here because we're not just looking for the most beautiful airport. (Certainly that can be the reason, but you're welcome to nominate them for other reasons as well.) Which airport is the most fun to spend time in? Which looks the best as you approach it? Which one is the most technologically advanced? Alas, for our nomination we fall back on that old standard beauty. 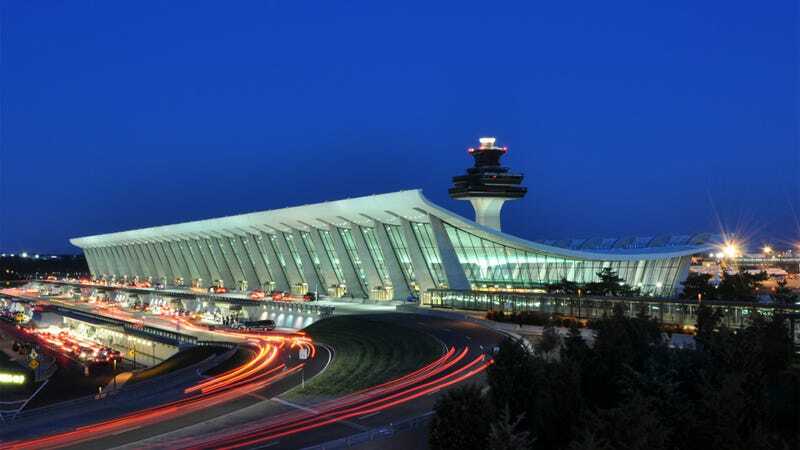 Washington Dulles International Airport (IAD for those of you who had to memorize your country's airport codes in elementary school), was designed by Finnish architect Eero Saarinen. It contains no inner support columns, meaning the roof floats free over the giant interior concourse. Sure, it really doesn't work that well by today's standards (something the airport is trying to fix) but it mimics a plane taking off! What could be better? Apparently, nothing, since when Taipei needed an airport they decide to just copy it. Any other cool airports out there? Being Saarinen fans, we can think of at least one more. Have at it in Kinja!